Using a pressure cooker to prepare London broil, also called flank steak, means you won't have to slave over a stove or sweat in a kitchen with the oven on. Instead, you can prepare this cut of meat in less than 20 minutes in a pressure cooker. Combining this method of cooking with a marinade to tenderize and add flavor can improve this typically tough cut of meat. Marinate London broil for 24 hours prior to cooking. This helps tenderize the meat and add flavor. You can use any marinade you like; Italian dressing often makes a good choice. You may also consider using a mixture of red wine vinegar, garlic and Worcestershire sauce as a marinade. Make light cuts in the top and bottom of the London broil. This will encourage tenderness once it is done. Pour a couple of teaspoons of cooking oil in the cooker and heat the oil for about a minute. Add the London broil to the pressure cooker and turn the heat to high. Brown the London broil on each side. Cut off the heat and add a couple of cups of liquid to the pressure cooker. This can be beef broth, leftover marinade or another liquid of your choice. Place the cover on the pressure cooker and turn the heat under it to high to bring the cooker to 15 PSI. Maintain 15 PSI for about 15 minutes per pound of London broil. Turn off the heat under the pressure cooker and move the cooker to a cold burner. 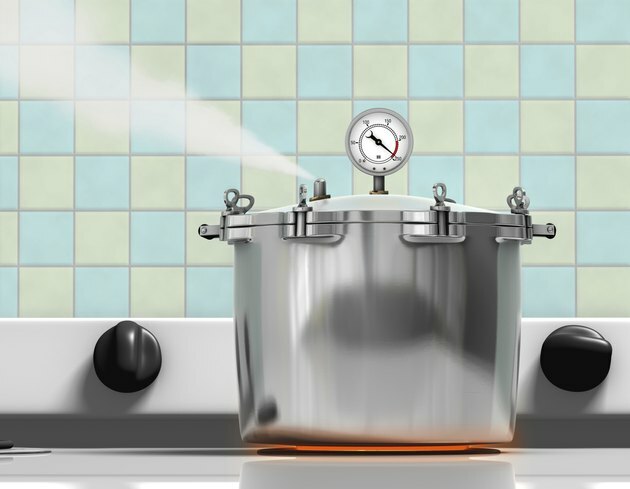 Allow the pressure cooker's PSI to drop until you can safely remove the lid. You'll know it has cooled enough when you see the air vent lock drop. Transfer the meat to a plate or platter and cut it into thin slices. Serve immediately after slicing it. Some models have an easy-to-read indicator that lets you know when the pressure in the unit has been released. This makes it easier to determine when you should open it. Most modern pressure cookers have safety mechanisms to prevent you from opening them prematurely.